Welcome to the start of another school year! The web team has gone through a number of changes over the summer. First, we’re no longer a part of Information Technology, and are now a component of Marketing and Creative Services. As part of that change, we’ve had a few personnel changes. First, we’re officially declaring Tom a member of the web team. Tom is a graphic design instructor, who we were fortunate enough to be able to snag as a half-time graphic design analyst. He, and the students he supervises in the Design and Media Center, have already made significant improvements to the look at feel of the website and our communications. David and Jim will be staying with Information Technology. While David will likely continue supporting our servers, Jim will be moving away from doing website content work and entirely into IT tasks. Thank you both for your time on the web team, and welcome Tom! The last few years, we’ve focused on some simple metrics to try and improve the Lane website. In 16-17 we worked primarily on reducing the size of the Lane website, going from 5768 pages to 5550. In 17-18, we expanded those goals again, but also added two traffic goals. We were successful in reducing the size of the website, dropping all the way to 4532 pages. But we missed our traffic goals, making only minor progress on the bounce rate and missing our session count goal entirely. Over the last two years, we’ve definitely learned that we do what we measure, so it’s important that our metrics properly reflect our intentions. For instance, one of the ways we were trying to simplify the Lane website was by reducing the number of pages. But one of the ways we met that goal was by cleaning out old training pages. Those pages probably aren’t why the website feels cluttered, but deleting those dozen pages definitely helped our metrics. Increase the number of organic referrals to the website by 5%, from 1,358,302 to 1,426,217 (or more). Keep your eyes on the homepage – you’ll see a change as soon as we’re ready to launch the pages to accomplish goal number 2, hopefully in the next few weeks. This is our first of five check-ins on if we’re making progress on our web team goals. Met! We’re down to 5006 pages, which is almost a 10% reduction. Much of this was because we eliminated third party scholarship listings, in favor of more comprehensive scholarship search websites (our listings were always out of date). We’re going to continue trying to cull content, but we’re going to focus most of our effort on some of the other goals. We’re more than half way to this goal, with just 232 pages with more than 15,000 characters. Much of our progress here came from removing pages that related to our former president, and which are now on our archive site. Additional progress will be harder. At an average length of 4412 characters, we’re about half way to our goal. Unfortunately, we’ve made no progress on this goal, with our average age unchanged. Please help us out by editing your pages! Since these are annual goals, they’re a little harder to compare against. But we can compare similar time periods. For the first two months, 6/14-8/14, comparing 2016 to 2017, our session counts have increased by 2.64%, but our bounce rate has increased by 3%. We need your help with this goal as well! Think about the keywords that your page targets, and make sure your content contains those words. And whenever possible, please make sure your page includes some sort of target or goal you’re trying to get your visitors to do. And, as always, please feel free to contact us on the web team if we can help in any way! 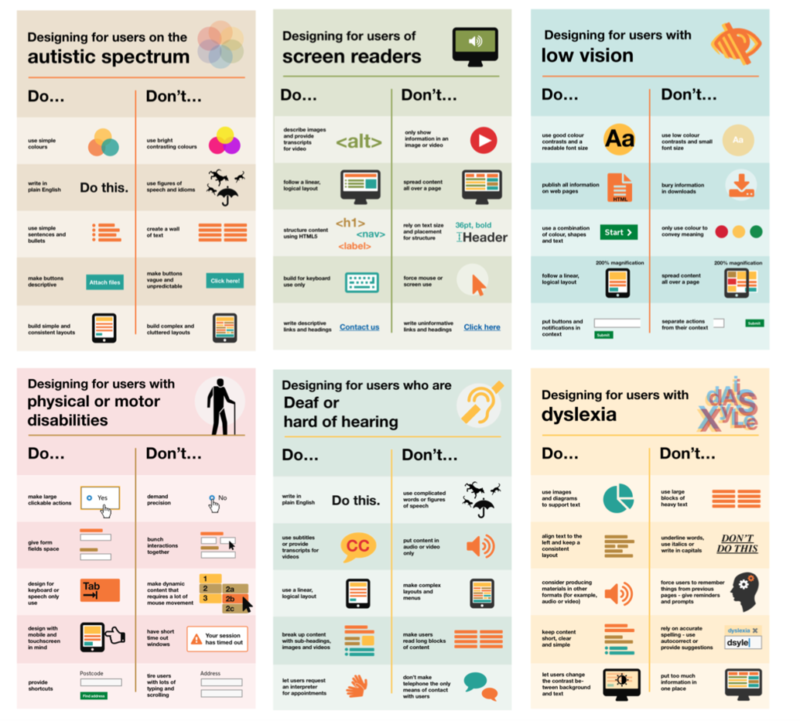 The UK Government Digital Service has published a great set of posters about designing for accessibility. They’re a great reminder that designing for accessibility isn’t just about screen reader, but about designing for a lot of different conditions that impact a lot of people.